Parable is a succinct, didactic story, in prose or verse, which illustrates one or more instructive lessons or principles. Parables are common in all religious beliefs of the world such as Hinduism, Buddhism, Jainism, Islam, Zorastrianism and others. Bible:But without a parable spake he not unto them: and when they were alone, he expounded all things to his disciples. Bible:Now learn a parable of the fig tree; When her branch is yet tender, and putteth forth leaves, ye know that summer is near: / So ye in like manner, when ye shall see these things come to pass, know that it is nigh, even at the doors. Bible:...What man of you, having an hundred sheep, if he lose one of them, doth not leave the ninety and nine in the wilderness, and go after that which is lost, until he find it?And when he hath found it, he layeth it on his shoulders rejoicing. Walter Kaufmann (philosopher): But the four Evangelists agree in ascribing to Jesus evasive and equivocal answers to plain questions, not only those of the high priest and Pilate; and quite generally the Jesus of the New Testament avoids straightforward statements, preferring parables. Bohr's sort of humor, use of parables and stories, tolerance, dependence on family, feelings of indebtedness, obligation, and guilt, and his sense of responsibility for science, community, and, ultimately, humankind in general, are common traits of the Jewish intellectual. So too is a well-fortified atheism. Bohr ended with no religious belief and a dislike of all religions that claimed to base their teachings on revelations. One of the greatest of poets, Coleridge was one of the wisest of men, and it was not for nothing that he read us this parable. Let us have a little less of "hands across the sea", and a little more of that elemental distrust that is the security of nations. War loves to come like a thief in the night; professions of eternal amity provide the night. Each parable makes one point per main character. The fact that religions through the ages have spoken in images, parables, and paradoxes means simply that there are no other ways of grasping the reality to which they refer. But that does not mean that it is not a genuine reality. And splitting this reality into an objective and a subjective side won't get us very far. Hear ye therefore the parable of the sower. When any one heareth the word of the kingdom, and understandeth 'not, then cometh the wicked one, and catcheth away that which was sown in his heart. This is he which received seed by the wayside. He [Jesus] speaks in parables, and though we have approached these parables reverentially all these many years and have heard them expounded as grave and reverent vehicles of holy truth, I suspect that many if not all of them were originally not grave at all but were antic, comic, often more than just a little shocking. The Parables of our Lord, while they were addressed to all ranks, and adapted to all circumstances, always held in view the elucidation of the doctrines of Christianity and the enforcement of its precepts: They spake the same language to the prince and the peasant, they guarded the rights of God, and developed the scheme of salvation: they shewed that the present is nothing, but as it is subordinated to the interests of eternity. The sages of antiquity employed parables to elucidate various subjects – sometimes philosophical principles – at others moral truths at others, maxims of economy –Jesus excelled in all. The parables of Jesus in the Gospels are considered the single most important source for discovering how Jesus himself taught and proclaimed his message. If the story-tellers could ha' got decency and good morals from true stories, who'd have troubled to invent parables? The final authority for evaluating a parable is the parable itself. Werner Heisenberg: The fact that religions through the ages have spoken in images, parables, and paradoxes means simply that there are no other ways of grasping the reality to which they refer. But that does not mean that it is not a genuine reality. And splitting the reality into an objective side won’t get us very far. Ellen G. White:So wide was Christ's view of truth, so extended His teaching, that every phase of nature was employed in illustrating truth. The scenes upon which the eye daily rests were all connected with some spiritual truth, so that nature is clothed with the parables of the Master. The fact that religions through the ages have spoken in images, parables, and paradoxes means simply that there are no other ways of grasping the reality to which they refer. But that does not mean that it is not a genuine reality. And splitting the reality into an objective side won’t get us very far. The soul speaks to itself in parables. Like those dreams that have pleased us. But the four Evangelists agree in ascribing to Jesus evasive and equivocal answers to plain questions, not only those of the high priest and Pilate; and quite generally the Jesus of the New Testament avoids straightforward statements, preferring parables . To paraphrase: Everything happening, great and small, is a parable whereby God speaks to us, and the art of life is to get the message. Jesus of Nazareth could have chosen simply to express Himself in moral precepts; but like a great poet He chose the form of the parable, wonderful short stories that entertained and clothed the moral precept in an eternal form. It is not sufficient to catch man's mind, you must also catch the imaginative faculties of his mind. Jesus’ view of nature and life, which sometimes shines through his speeches and parables in fragments and hidden allusions, shows quite clearly that he understood this fact. Men are in the habit, when the truth is exhibited by the servants of God, of saying, All is mystery, they have spoken in parables, and, therefore, are not to be understood. The reasons Jesus taught in parables was to conceal his message from "those outside". Another reason why Jesus taught in parables appears to conflict with the first, for a second reason was to reveal and illustrate his message to both his followers and “those outside”. A parable is a form of teaching in which one thing is thrown beside another. Hence its radical idea is comparison. Now the parable is this: The seed is the word of God. And when his disciples asked him what the parable meant, he said “to you it has been given to know the secrets of the kingdom of God, but for others they are in parables so that ‘seeing they may not see and hearing they may not hear'. Where is he that is born king of the Jews? For Amalek he took up his parable, and said, Amalek was the first of the nations; the first and the most powerful of the neighbouring nations - but his latter end shall be that he perish for ever. And he looked on the Kenite, and took up his parable, and said, Strong is thy dwelling place, and thou puttest thy nest in a rock. And he took up his parable, and said, Alas, who shall live when God doeth this. We will not hide them from their children shewing to the generation to come the praises of the Lord, and his strength, and his wonderful works that he hath done. Now learn a parable of the fig tree; When her branch is yet tender, and putteth forth leaves, ye know that summer is near: / So ye in like manner, when ye shall see these things come to pass, know that it is nigh, even at the doors. When they now shoot forth, ye see and know of your own slaves that summer is now nigh at hand. And when he hath found it, he layeth it on his shoulders, Happiness:rejoicing. Realm of parables cover: The Spiritual Realm, Natural Phenomena, Animate Nature, and Human Life (aspects of physical, domestic, pastoral, commercial, civil, social and religious). The Holy Spirit is our authority for Affirming that the Tabernacle, which Moses reared in the wilderness was parable of a more glorious heritage. The Parabel of the Wounded Prophet...action parables must have made a deep impression on those who saw and heard them... According to Josephus ‘the certain man’ who acted this parable was Micaiah, the son of Imlah. The Parable of the Two Sons is of the woman of Tekoa spoken at the clever instigation of Joab who was “wily and politic and unscrupulous, [and well able] to read human character and discern human motives through a very small crevice...I was meant to promote Joab’s scheme of self–interest and self-preservation. Herbert Lockyer. All the Parables of the Bible. Bible parables, especially those of the Jesus, are the choicest examples of figurative speech employed to express and enforce Divine truths. There is nothing of the miraculous in parables, which, in the main, are natural and inevitable, and illustrate grace and judgment. Without a parable spake He not unto them. He [Jesus] did not invent this form of teaching. Parables go back to antiquity. In the age and country in which Christ appeared, parables were a common and popular method of instruction, for both parables and fables were popular among the people of the East. ...the Old Testament makes a wide use of parable, showing sometimes alike in spirit, form, and language, a remarkable resemblance to the parables of the New Testament. The Old Testament Parables are: Story-Parables of which that of the trees is an instance, Sermon Parables as found in the Vineyard, ...and Symbol - Parables as illustrated by the Two Sticks. In the New Testament the word “parable” takes on a varying meaning and form and is not confined to those lengthened narratives in the Gospels we know as Christ’s parables. Dealing with the truths of God, parables are correspondingly lofty, with illustrations true to reality – never monstrous or unnatural. Speeches and sentences, full of spiritual wisdom and truth are called parables for two reasons: 1. Because they carry conviction and divine authority. 2. Because they are as touchstones of truth – they are rules, and therefore ought to rule. Among the many advantages: Parable attract, and when fully understood are sure to be remembered...; Parables greatly help the mind and thinking faculty...; Parables stir up, or excite the affections, and awaken consciences as when hell in parable is set up as a furnace of fire, and conscience by a gnawing worm; Parables arrest and hold attention...; Parables preserve the truth...And mere words are constantly changing their meaning, whereas the symbols of life and nature, as such as our Lord used in His parables, are as abiding as nature and life themselves. The parables are not to be handled as if they were a storehouse of texts. Each parable must be seen with its own distinctive peculiarity, and any analogies made must be real, not imaginary, and substance to the main lesson of the parable. The Parable of the Tabernacle: The Holy Spirit is our authority for Affirming that the Tabernacle, which Moses reared in the wilderness was parable of a more glorious heritage. ”The Holy Spirit this signifying...the first tabernacle... was a figure (Greek, parable) for the time then present. (Hebrews 9:8,9)...The main features of the Tabernacle was its three-fold division – a trinity in unity: The Outer court...; The Inner court…; and the Inner Most Court or Holy of Holies. The Parables of Balam: ...prophetic parables of prophet Balam are among the noblest and most distinct in Old Testament Scriptures. The Parable of the Trees by Jotahm delivered to the king and people from Mount Gerizim; he then fled for his life. The Parable of Ewe Lamb used by Nathan is parable of reproof is a touching story of the Ewe Lamb awoke the better nature of King David... It was meant to convict David of his sin and to induce true repentance. The Parable of the Wounded Prophet...action parables must have made a deep impression on those who saw and heard them... According to Josephus ‘the certain man’ who acted this parable was Micaiah, the son of Imlah. Gospel of Matthew:Originally this parable was intended to teach preparedness for certain developments that were to take place in Jesus’ earthly ministry. Later, however, after the crisis in Jesus’ ministry to which the parable first pointed had passed, the church modified the parable, adding an eschatological setting in order to prepare men for the final world crisis which was then believed to be approaching. Then shall the kingdom of heaven be likened unto ten virgins, which took their lamps and went forth to meet the bridegroom. Five were wise, and five were foolish. They that were foolish took their lamps, and took no oil with them. But the wise took all the oil with them. And while they went to buy, the Bridgroom came; and they were ready went in with him to the marriage; and door was shut. Watch therefore; for ye know neither the day or the hour wherein the Son of man cometh. The subject of this parable is, the Church, - the congregation of believers, - with reference to the experiences and qualifications necessary to secure the high honours of the world to come. It refers to a state of things preceding the second advent of Christ and having special regard to that great event. Originally this parable was intended to teach preparedness for certain developments that were to take place in Jesus’ earthly ministry. Later, however, after the crisis in Jesus’ ministry to which the parable first pointed had passed, the church modified the parable, adding an eschatological setting in order to prepare men for the final world crisis which was then believed to be approaching. The Bible:...He said to him. Son, you are always with me and all that is mine is yours. But it was appropriate to celebrate and be glad, for this, your brother, was dead, and is alive again. He was lost, and is found. He said a certain man had two sons. The younger of them said to his father.‘Give me my share of your property'. He divided his livelihood between them. Not many days after, the younger son gathered all of this together and traveled into a far country. There he wasted his property with riotous living. When he had spent all of it, there arose a severe famine in that country and he began to be in need. He went and joined himself to one of the citizens of that country, and he sent him into his fields to feed pigs. He wanted to fill his belly with the husks that the pigs ate, but no one gave him any. But when he came to himself he said, "How many hired servants of my father's have bread enough to spare, and I'm dying with hunger! I will get up and go to my father, and will tell him, 'Father, I have sinned against heaven, and in your sight. I am no more worthy to be called your son. Make me as one of your hired servants”. He arose, and came to his father. But while he was still far off, his father saw him, and was moved with compassion, and ran towards him, and fell on his neck, and kissed him. The son said to him, Father, I have sinned against Heaven and in your sight I am no longer worthy to be called your son. But the father said to his servants, Bring out the best robe and put it on him. Put a ring on his hand and shoes on his feet. Bring the fattened calf, kill and let us eat and celebrate for this my son was dead and is alive again. He was lost and is found. They began to celebrate. Now his elder son was in the field. Ashe came near the house, he heard music and dancing. He called one of the servants to him and asked him what was going on. He said to him, ‘Your brother has come, and your father has killed the fattened calf because he has received him safe and healthy. But he was angry and would not go in. Therefore his father came out and begged him. But he answered his father, "Behold, these many years I have served you, and I never disobeyed a commandment of yours, but you never gave me a goat, that I might celebrate with my friends. But when this, your son, came, who has devoured your living with prostitutes, you killed the fattened calf for him. He said to him. Son, you are always with me and all that is mine is yours. ...I tell you that even so there will be more joy in heaven over one sinner who repents, than over ninety-nine righteous people who need no repentance. Now all the tax collectors and sinners were coming close to Him to hear Him. The Pharsees and the Scribes murmured, saying “This man welcomes sinners and eats with them”. "Which of you men, if you had one hundred sheep, and lost one of them, wouldn't leave the ninety-nine in the wilderness, and go after the one that was lost, until he found it? When he has found it, he carries it on his shoulders, rejoicing. I tell you that even so there will be more joy in heaven over one sinner who repents, than over ninety-nine righteous people who need no repentance. The Bible:But a certain Samaritan, as he travelled, came where he was. When he saw him, he was moved with compassion, came to him, and bound up his wounds, pouring on oil and wine. He set him on his own animal, and brought him to an inn, and took care of him. Now which of these three do you think seemed to be a neighbour to him who fell among the robbers?" He answered, "You shall love the Lord your God with all your heart, with all your soul, with all your strength, with all your mind, [Deuteronomy 6:5]; and your neighbour as yourself [Leviticus 19:18]." Jesus answered, "A certain man was going down from Jerusalem to Jericho, and he fell among robbers, who both stripped him and beat him, and departed, leaving him half dead. By chance a certain priest was going down that way. When he saw him, he passed by on the other side. In the same way a Levite also, when he came to the place, and saw him, passed by on the other side. But a certain Samaritan, as he travelled, came where he was. When he saw him, he was moved with compassion, came to him, and bound up his wounds, pouring on oil and wine. He set him on his own animal, and brought him to an inn, and took care of him. Budddhist scripture:...Parable of the Blind Men and the Elephant, a version of this well-known Indian tale from the Buddhist canon, but some assert it is of Jain origin. The Buddha [answered to his deciples],"Once upon a time there was a certain raja who called to his servant and said, 'Come, good fellow, go and gather together in one place all the men of Savatthi who were born blind... and show them an elephant. Very good, sire,' replied the servant, and he did as he was told. 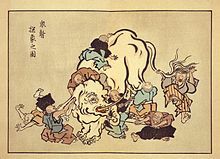 Buddha, the Blessed One, gives the parable of the blind men and the elephant to illustrate that partial knowledge always breeds bigotry and fanaticism. Those who think that truth is in their exclusive keeping and that their religion is the only approach to God, ‘see only one side thing like the blind men in the parable. Budddhist scripture, w:UdanaUdana 68-69: Parable of the Blind Men and the Elephant, a version of this well-known Indian tale from the Buddhist canon, but some assert it is of Jain origin. The Buddha [answered to his disciples],"Once upon a time there was a certain King|raja who called to his servant and said, 'Come, good fellow, go and gather together in one place all the men of Savatthi who were born blind... and show them an elephant. Very good, sire,' replied the servant, and he did as he was told. The archeologist-and-elephant cartoon (created by Carrol Ellick and Richard Lange) was inspired by John Godfrey Saxe’s famous poem “the Blind Men and Elephant”. Saxe retold a parable from the Udana, a scripture of the Indian subcontinent. One anonymous translation of the original concludes with the Buddha dispensing an uplifting verse. For preacher and monk the honored name! For, quarreling, each to his view they cling. Vivekananda:You are lions, you are souls, pure infinite and perfect. The might of the universe is within you. Why weepest though, my friend? There is no disease or misery for thee, but though art like the infinite sky; clouds of various colours come over it, play for a moment, then vanish. But the sky is ever the same eternal blue. George Orwell, otherwise temperamentally distant from Gandhi, saw exactly the tensed, pageant-like character of Gandhi’s life, and its status as a theatrical parable when he observed of Gandhi that ‘his whole life was a sort of pilgrimage in which every act was significant. You are lions, you are souls, pur infinite and perfect. The might of the universe is within you. Why weepest though, my friend? There is no disease or misery for thee, but though art like the infinite sky; clouds of variuos colours come over it, play for a moment, then vanish. But the sky is ever the same eternal blue. The parable of those who spend their possessions for the sake of God is that of a grain out of which grow seven ears, in every ear a hundred grains: for God grants manifold increase unto whom He wills; and God is infinite, all-knowing. They who spend their possessions for the sake of God and do not thereafter mar their spending by stressing their own benevolence and hurting [the feelings of the needy] shall have their reward with their Sustainer, and no fear need they have, and neither shall they grieve. A kind word and the veiling of another’s want is better than a charitable deed followed by hurt. O you who have attained to faith! Do not deprive your charitable deeds of all their worth by stressing your own benevolence and hurting [the feelings of the needy], as does he who spends his wealth only to be seen and praised by men, and believes not in God and the Last Day...Such as these shall have no gain whatever from all their [good] works: for God does not guide people who refuse to acknowledge the truth. And the parable of those who spend their possessions out of a longing to please God, and out of their own inner certainty, is that of a garden on high, fertile ground: a rainstorm smites it, and thereupon it brings forth its fruit twofold; and if no rainstorm smites it, soft rain [falls upon it]. And God sees all that you do. Sufi tradition of Islam frequently used parables to lay the ground work for teaching the basic principles of Islam to beginers. 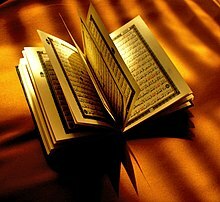 Dozens of parables are found in the Qura’n and hundreds of parables are known within the Sufi tradition of Islam. Parables were told and adapted many times for use in each successive generation. Parables were owned by the community and specific authorship of individual parables was unimportant. ”Indeed”, said the king. “From which verse”? The vizier went on: ”From the verse which speaks of the Paradise which awaits those who control their anger and forgive, for God loves men of goodwill”. The king was angry with the foreign captive who had thrown down before him. ”Put him to death he ordered”. The captive had been expecting it. He had been up to know been silent but, now that death was certain, he gave up all hope and cursed the king, using the foulest words in his native tongue. He was like a cat, spitting and screeching at dogs who are its throat. The king not knowing the language did not understand what the captive was screaming, but he knew one or two of his viziers were familiar with the tongue. ”What is he saying?” he asked them. The king overheard. “What was that” he asked. By telling a lie to the king, the first vizier was using love to promote a more compassionate outcome for both the captive and the king. The captive would have his life and the king would not have innocent blood on his hands. And especially above the heavens: for all gods are poets’ parables, poets’ prevarications. Verily, it always lifts us higher—specifically to the realm of the clouds, upon these we place our motly bastards and call them gods and overmen. Ah, how weary I am of all the imperfection which must at all costs become event! Ah, how weary I am of the poets.